Embutido is a type of meatloaf prepared Filipino style. Though a well known dish for the holidays, Embutido can be enjoyed every day without any hassle. Several meat processing companies now produce this meatloaf for commercial purposes; all you have to do is grab one from your favorite grocery store. There are a lot of ingredients used when cooking Embutido but the main ingredient is ground pork. Raisins, bell peppers, cheeses, and pickle relish are added to extra flavor and texture. Bread crumbs and eggs are also added to help bind all the ingredients together. It is then steamed for an hour or so and can be served immediately or as cold cuts after being chilled. It can be served as a main dish with rice or as a sandwich filling. Most kids (and even adults) enjoy dipping Embutido with catsup. 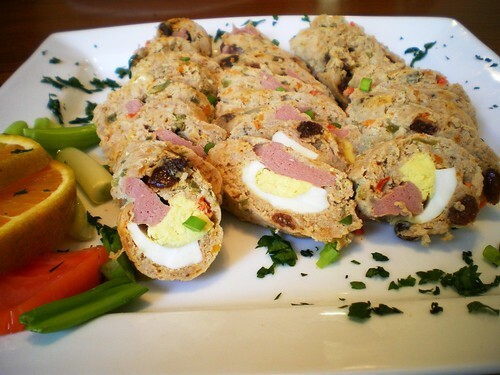 There are also variations of Embutido wherein a whole hard boiled egg is stuffed inside the pork mixture. The traditional Embutido is wrapped in pig’s intestines but today, an aluminum foil is used to shape and wrap the mixture. It has a fairly long shelf life so it is perfect for those unexpected events and visitors.